Do you need your exercise bike or indoor cycling bike repaired? 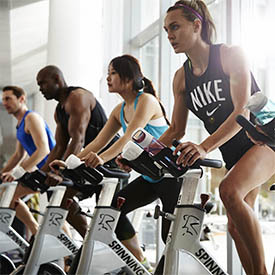 Whether you are a gym with Spinning® bikes, Schwinn Indoor Cycle, LeMond Revmaster, or any other type of indoor exercise or cycling bike we can help you with your fitness equipment repair needs. Please see our full line of exercise bike parts, indoor cycling parts, park tools selection, and indoor cycling and spin bike accessories at the KRISLYNN LLC. Either you can replace the indoor cycle parts yourself, or if you are in our service area feel free to call us to schedule a visit. Your spinning® class or cycle class participants will be happy to have your indoor cycling program running smoothly for all your participants. Even if you have just one exercise bike at home, please call us at 410-859-3538 to schedule a facility or home visit. Other Services: Please also note: Some of our other services include Treadmill adjustment, Treadmill belt replacement, Treadmill motor repair, elliptical repair, and Fitness console replacement. We are certified through Stairmaster and Schwinn Fitness. Please check our fitness equipment and repair service area map to see if we can help you fix one indoor cycling bikes, relocate, move or repair your entire indoor cycling fitness facility or even if you need a regular service done on your indoor cycling program. (Service Area Map).